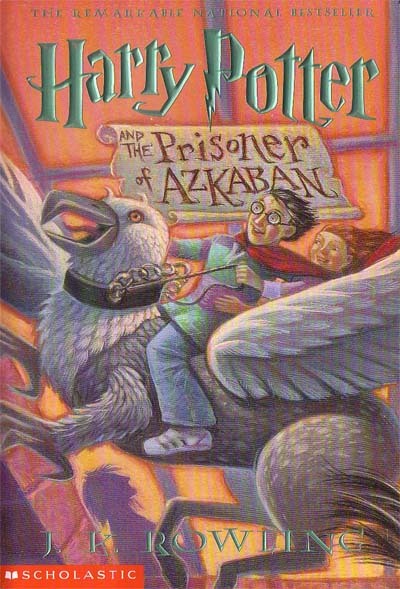 The Prisoner of Azkaban is one of my two favorite HP books, along with the Half-Blood Prince. I never get tired of it, no matter how many times I read it. This is Rowling at her best, in writing, in characterization, and in plot. I won’t summarize. Most people have read it anyway, and if they haven’t, either they don’t want to or they might one day. For those in the latter category, I wouldn’t want to ruin it. I read the hardback version of the book, as I’ve always read the paperback version before. Again, still looking for discrepancies between the two texts. I want to say first that I must have been a copyeditor in a former life because in combing the text, I found three places with copyediting mistakes, all pertaining to endquotes. Either the endquote wasn’t there when it should have been (once), or there was a misplaced endquote (twice). These mistakes were NOT caught between hardback and paperback versions, though, and they are the same in both books. You know what Harry and Ron are like, wandering off by themselves–they’ve ended up in the Forbidden Forest twice! You know what Harry and Ron are like, wandering off by themselves–they’ve even ended up in the Forbidden Forest! This is the only difference between the two texts that I found. So that’s it for month three of this little Harry Potter comparison! See you guys next month with my least favorite book of the series, The Goblet of Fire. Note: Review date is only an approximate of when this book was read/reviewed in 2010. Note: Originally read in 2005 and many times since. This entry was posted in 2008, 2009, 2010, 2012, 2014, Children's, Prose and tagged favorite, Harry Potter, humor, memorable, multi-read, reread, speculative. Bookmark the permalink.